Just one week left. Don't miss out on the largest outdoor painting competition in the United States. As part of the new collaboration between the Academy Art Museum and the Avalon Foundation the Museum will present “Curator’s Choice,” a selection of Plein Air paintings from its Permanent Collection at the Avalon Theater chosen by Senior Curator Anke Van Wagenberg. The exhibition highlights prize winners and leading pieces from Plein Air Easton from 2006–08. The paintings were donated to the Museum by a generous patron of both institutions. The exhibition will include work by popular Plein Air artists such as Tim Bell, Jill Carver, Stephen Griffin and others. Words of Advice: Paintings at Plein Air Easton move fast, so if you love a painting - BUY IT. You are welcome to make offers to purchase paintings right off easels throughout the week, anytime, though it is up to the artist to decide when it is for sale. Plein Air Easton's Collectors' Party is very popular and is, traditionally, an advance sell-out. Words of Advice - Do not be afraid! Bring your paints, set up your easel, ask questions and make friends. We'll point you toward opportunities for anyone (not just the 58 juried artists) to paint, and every opportunity to watch and learn. Jump on in! What is Plein Air Easton? 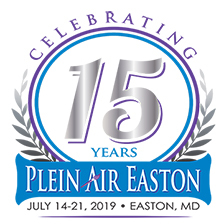 In its 11th year, Plein Air Easton is the largest and most prestigious outdoor painting competition in the United States. The festival is the work of the non-profit Avalon Foundation. The object of Plein Air Easton is to expose the area’s vibrant arts community to a larger market. The Avalon Foundation’s mission is to improve the quality of life for the people living on the Eastern Shore of Maryland. Sign up for Plein Air Easton news.